Walled Garden Lodge in Camerton, near Hull sleeps 4 people. Walled Garden Lodge near Hull has its own hot tub to relax in after a day of exploring the local area; whether it’s a trip to the east coast, or a day out in Hull, the city of culture, where the Deep Subsea Aquarium is always worth a visit. 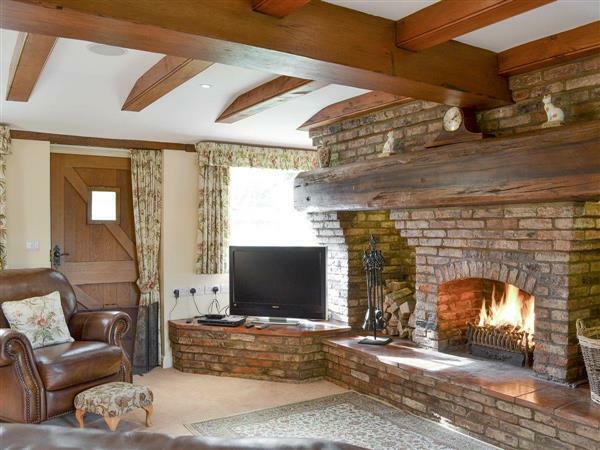 This detached holiday cottage, in the grounds of the owner’s home, provides the perfect base for both families and couples to explore this delightful location, or to simply relax and unwind. For outdoor enthusiasts, there are good walks and cycle routes throughout the area, and it is just a short leisurely stroll to the coast and back, with good pubs and cafés to enjoy refreshments along the way. The village of Camerton is just a short walk away with shops and pubs to enjoy, and well worth a visit. Within half an hour’s drive, there are the coastal resorts of Hornsea and Withernsea, or for guests who enjoy birdwatching, Spurn Point is also close by. Beverley and Hull provide the perfect place for an afternoon of shopping, or head to York, where you can book in for afternoon tea at Betty’s Tearoom. The beach is 11 miles from Walled Garden Lodge near Hull. With the shop ¾ mile, and the pub & restaurant are ½ mile. Walled Garden Lodge near Hull is all on the ground floor. Kitchen/dining room: With gas range, microwave, fridge/freezer, dishwasher, washing machine and tumble dryer. Sun room: With 32 Freeview TV. Oil central heating, gas, electricity, bed linen, towels, Wi-Fi and fuel for wood burner included. Travel cot, highchair and stairgate available on request. Welcome pack. Large lawned garden with decked area, sitting-out area, garden furniture and barbecue. Hot tub for 4 (private). Bike store. Private parking for 3 cars. No smoking. Please note: There are 3 steps in the garden and a fenced pond in the grounds, 10 yards away. Holidays at Walled Garden Lodge run from Friday to Friday. Pets allowed at Walled Garden Lodge. For a better idea of where Walled Garden Lodge is, you can see Walled Garden Lodge on the map below. Walled Garden Lodge is in North Humberside; should you be on the lookout for a special offer, you can find all the special offers in North Humberside. It's always worth checking to see what is on offer at the moment. Do you want to holiday near Walled Garden Lodge (UKC1349), you can see other cottages within 25 miles of Walled Garden Lodge; have a look to find your perfect holiday location.